No. 287 W. T. DEAN to Dara GRIFFIN on January 15, 1893 by W. H. Preston, MG, at Mr. William Griffin. Bond: W. T. Dean and L. G. Dean. Clay County Alabama Historical Society, Cemeteries of Clay County, Alabama, La Grange, GA: Family Tree, 1987. Biography* � Mrs. L. Z. (M. Claire Griffin) Jelin wrote Jul 1994 that her mother's name was "Mayona Willingham" and Mayona's mother was "Mary Lewis." In a 12 Jul 1994 letter, H. Clay Griffin wrote that his mother's name was "Mayona Willingham." He added: My mother's mother was Mary Ann Lewis Willingham whose first husband was James Ezekiel Willingham (who died in his 30's). Mary Ann Lewis Willingham remarried after her first husband's death. She died in childbirth in 1886. My mother was raised by her grandparents Isaac Ramsey William Lewis & Martha Ann Creel. Many of these people were buried in Coosa Valley Cemetery near Eden [Coosa Co., AL? can't locate on current map], but graves moved because of water impoundment. Biography* � Lelia Eugenia was named Eugenia after her mother. Mrs. Charles (Margaret Whatley) Lee wrote 31 Jan 1979: I loved my Aunt Lelia. If there was a saint, she was one. She was also good natured and quiet. She was so good to me. She used to make me such pretty little dresses. She would come get me in the buggy and I'd stay sometimes a week with her. She was a great cook. It really hurt me when she died. Yes, I remember all about the house and surrounding property, including the barn, old garage for Aunt Maude's buggy, storage house and smoke house and best of all a "double seat out- house"!!!! This will take awhile for me to describe, but I will be happy to share my precious memories. We were there once each week as long as she lived and yes, I remember Aunt Lelia WELL. She was an excellent cook and always had the best "tea cakes" you've ever tasted. Aunt Maude was a great cook as well. Elaine and I always looked forward to the summers because we enjoyed an entire week at their sweet modest little home. Aunt Lelia planted a huge garden and their fruit trees were bountiful, which she allowed us to participate in preserving everything available. Her peaches, apples, pears and grapes were the best......oh, and the many fig bushes, plus the mouth-watering strawberries! Just for the sake of keeping an oddity, they had two Quince trees across the winding little dirt road. Flowers, for every season, adorned the entire place and especially around the house. The front yard was small and practically in the road with a tiny little mailbox surrounded by petunias. The back yard was well groomed by the hands of Aunt Lelia who meticulously swept it weekly with a broom made of oak limbs.If a sprig of grass were detected, a sharp- blade- hoe took care of it immediately . Now you must remember that the standard attire for all three ladies was long skirts, as well as long underskirts, long sleeves (usually dresses were always made by the same pattern with white collars), long black stockings and black low heel shoes. All clothes, table cloths, napkins, scarves and curtains were heavily starched with Grandmother's homemadeconcoction of ingredients. Spotless was an understatement for the interior as well as exterior. In an entry for his brother, James O. Griffin, on p. 253 of Vol. 2 of the 1927 edition of the History of Alabama and Her People published by the American Historical Society, Inc., Joseph Albertus Griffin was listed as a "credit man for the Haverty Furniture Company at Birmingham...." 27 Jul 1967, J. A. Griffin and his wife made the front page of The Sylacauga Advance: HAPPY BIRTHDAY MR. GRIFFIN Today is a big day for Mr. J. A. Griffin! For the company he has been with for some 33 years will close its doors early so that all his associates can attend a party for him at Willow Point Country Club. The occasion is in celebration of Mr. Griffin's 87th birthday and his associates will watch him blow candles and will sing "Happy Birthday" to a "grand guy". Born in [Good Hope near] Lineville, Mr. Griffin attended schools there and then graduated from Massey Business College in Birmingham. He married lovely Flora Inzer of Eden and in December 1967, they will celebrate their 53rd wedding anniversary. Mr. Griffin joined Sokol's in 1934 and he came to Sylacauga as store manager in 1938. He has been active in many phases of civic and church life as well as carrying much weight in business circles. He is an active member of the Sylacauga Exchange Club and the First Baptist Church. The Griffins have a new home on the Old Rockford Road, after having operated Oak Lawn Inn for many years. They have three children, Mrs. Claude Newman, Sylacauga; Mrs. Edward Marston, Manchester, N.H; Joe Griffin, Birmingham; and seven grandchildren. All Sylacauga joins with his Sokol's friends in saying "Happy Birthday, Mr. Griffin." The following is from an unknown source, probably The Sylacauga Advance: J. A. Griffin Gives Drew Court Library Air Conditioner The Drew Court Library patrons can now use their facility in cool comfort thanks to Mr. J. A. Griffin of Sokol's who has given an air conditioner for the room. Presentation was made at last Thursday's meeting of the Exchange Club following a talk by Miss Dorothy Lee, librarian B. B. Comer Memorial Library. Miss Lee, program speaker for the day, told the "Library Story". After Mr. Griffin gave the air conditioner for Sokol's, the Exchange Club presented a check to help defray installation costs. Miss Lee reported that she had also received a check from Jack Nealeans. The following is from The Birmingham News for Wednesday, 29 Jul 1970: Alabama Amblings Retire at 89? Why should one? BY LEONARD STERN, News staff writer SYLACAUGA At the age of 89, Joseph Albertus Griffin decided that he had enough of his three month retirement from the furniture business and started back to work. Daddy Joe, as his great-grandchildren called him, began managing a furniture store in Sylacauga when he was 60. Although the retirement age is 65, Bert kept putting it off every five years on up to the age of 89 when the store finally changed ownership. Three months later, he accepted a position at another furniture store, working three days a week. Bert was never the kind to lie around, his wife says. He keeps up the lawns in front of their two houses in Sylacauga and is an avid rose gardener. He's never been to a hospital in his life, has no bad habits, an amazing eyesight and doesn't like to be called an "old man," she says. Griffin reads several current event publications and keeps up with the latest styles in men's wear. Besides his work and gardening, Griffin belongs to the Exchange Club, and has supposedly never missed a meeting. He is a handshaker every Sunday at the First Baptist Church and on its Board of Trustees. Griffin is the type of man who has never complained, which may have been the answer to his long and active life. After 56 years of marriage, Mrs. Griffin says that she has never seen him worry and that he managed to keep busy all of the time. This week, the Griffins were honored at a luncheon by their son Joe Griffin of Birmingham, and their two daughters, Mrs. Sala [Sara] Marston of Manchester, N.H., and Mrs. Ann Newman of Sylacauga. Relatives from Alabama, Georgia, Florida, Tennessee, and Virginia were among the 80 persons in to celebrate Daddy Joe's 90th birthday. In a 3 May 1977 letter, Mrs. E. A. (Ellaree Dean) Speer wrote that "Uncle Bert" was "in intensive care now - blood clot on lung.... Think this is 4 weeks he is in hospital." 16 Jul 1978 was declared "J. A. Griffin Day" by the First Baptist Church of Sylacauga and a special service was held at 10:55 a.m. The following is from the church Bulletin: It was with esteem and respect that our church voted last month to name today J. A. Griffin Day. On this Thursday, July 20, Mr. Griffin will celebrate his 98th birthday. Mr. Griffin is an honored member of our church, having served as deacon, trustee, church greeter and a faithful attender for many years. It is a pleasure to welcome the approximately 20 members of Mr. Griffin's family who are present with us today in the reserved section of our church. _____ The Sylacauga News noted that: The celebration, set aside at the recommendation of the deacons and a vote of the church, will not only show the admiration of his fellow church members but the dual purpose of celebrating his 98th birthday, Thursday, July 20. Griffin moved to Sylacauga in 1941 with his wife and three children, Joe, Ann, and Sara. He served as manager of Sokol's Furniture Company for thirty years and has also operated Oaklawn Inn for many years. He has served as deacon, trustee and church greeter over the years. In an 8 Feb 1979 letter, Mrs. G. W. (Elaine DeVaughn) Mendenhall wrote that "Uncle Bert is also in the hospital in Sylacauga with kidney infection." The following obituary is from p. 1 of The Sylacauga News for Thursday, 24 May 1979: Prominent Sylacaugan dies Tuesday J. A. Griffin, one of Sylacauga's oldest and most prominent citizens, died Tuesday afternoon at his residence on old Rockford Road. Griffin came to Sylacauga in 1941 as Manager of Sokol's. He worked in that position until the original store closed its doors forty years later. At that time Griffin was 89 years old. Not believing in retirement he went to Jefferson Furniture Company where he continued full time employment until the age of 92. A native of Clay County, Griffin was married to the former Flora Inzer in 1916. They celebrated their sixty-first wedding anniversary shortly before her death in 1976. The Griffin family purchased the Oaklawn Inn in the early forties, and it has belonged to the family since. Griffin's daughter, Anne Newman, still operates the inn. "People who stayed there years and years ago would come back through Sylacauga and stop to visit with Mr. and Mrs. Griffin," daughter-in-law, Mrs. Joe Griffin said. Biography* � George William Griffin was named William for his father and was known as "Will." A nephew, James M. Griffin, recalled that Will had brown eyes. In an article "Church plans reminder of big Lineville fire" on p. 18A of The Anniston Star Sunday, 28 May 1978, Will Griffin recalled the fire of 9 May 1913 which destroyed the First Methodist Church of Lineville: Slightly stooped but astonishingly alert, Griffin remembers standing in the street in front of the church as the flames licked around the steeple, and then, like paint dumped on a pyramid, spread down to engulf the entire two-story church. Last week he stood there again, this time in front of the citified brick edifice that replaced the weatherboard country-style church that burned. The burning was one of many things that separated Griffin from the familiar world he grew up in. He seems more in touch with dirt roads and wood-frames than with the blacktop and bricks that replaced them. "I don't know of one single thing that's like it was when I was growing up," he said. "Everything's reversed." One of those reversals was what he recalls as "a whale of a fire." He was a student at Lineville College [in a 5 Mar 1979 letter, a niece, Mrs. Charles (Margaret Whatley) Lee wrote that "Uncle Will is still wearing his class ring from 1913 when he finished the old Lineville College....], which closed its doors only two years later -- breaking another link with his past. "It took two or three hours (to burn)," he said. "There was no Lineville Fire Department. I was standing out in the street there while it was burning. We used to do that. When the fire would come, people would gather around and see it." He said he was "a little late getting down to see that fire" and missed the dashes by men of the church inside the flaming building, removing benches and church records, most of which were saved. "Of course there was a lot of regret and all, but they (the Methodists) just went right back to building a new one (church)," he said. He reflected on the days when life was hard, when "There wasn't any banks because there wasn't anything to put in them." He talked of "the good communities we used to have in the old days," and of his father, who enlisted under the Rebel flag as a 16-year-old in the waning days of the Civil War. And then, reflecting on the church fire in the scheme of his life, he said, "Sometimes these things don't seem so important in time. It makes it hard to remember them." The following is from an unknown source: Mr. Will Griffin Honored On 90th Birthday Mr. and Mrs. Emyl Griffin and family hosted a most enjoyable birthday dinner in their home for their uncle, Mr. Will Griffin, on Sunday, June 4. Mr. Griffin was celebrating his 90th birthday. He was one of eleven children born to Mr. and Mrs. William Henry Griffin, who lived in the Good Hope community at the time of his birth. He has a brother and a sister who join him in reaching the Golden Age--Miss Maude Griffin of Lineville age 88 and Mr. J. A. Griffin of Sylacauga age 92. Mr. Griffin was married to Miss Tomera Leslie Handley of this area on June 5, 1919. They have lived in and around Clay County most of the time with the exception of 19 years in Washington, D.C. At the time of his retirement, Mr. Griffin was in business here in Lineville. He has been a very active member of the Lineville Baptist Church and continues to support its many activities and needs. Those who joined in the delicious dinner and birthday celebration were: Mr. and Mrs. J. A. Griffin, Mr. and Mrs. Earl Smith, Mr. and Mrs. Minter Humphries, Sylacauga; Mr. and Mrs. Joe Griffin, Birmingham; Mr. and Mrs. Thomas Farned, Russellville; Mr. and Mrs. Ted Rice, Wedowee; Mr. and Mrs. Charles Lee, Mr. and Mrs. Lemuel Wallace and family, Mr. and Mrs. Joe Morris, Anniston; Mr. and Mrs. Edd [William Edmond] Samuels and family, Chattanooga, Tenn; Mr. and Mrs. Lewis W. Handley, Jr., and family, LaGrange, Georgia; Reverend and Mrs. Charles Handley and family, College Park, Georgia; Mrs. Lorin Reeves, Miss Minnie Reeves, Reverend and Mrs. John L. Higdon, Reverend and Mrs. G. L. Armstrong, Mrs. Mildred Kerley, Mr. Earl Reeves, Mr. and Mrs. Elmer Reeves and family, Mr. and Mrs. J. W. DeVaughn, Mr. and Mrs. George Mendenhall, Mr. Steve Robertson of Lineville. The following is from the 4 Jun 1972 Bulletin of the Line Baptist Church: Mr. Will Griffin It is unusual to have a man ninety years old in your congregation. It is also unusual to have a man ninety years old to mow the lawn and work with the shrubbery at the church. It is also unusual to have a man ninety years old to donate thirty-six Broadman Hymnal Jr. to the church. Just imagine a man ninety years old still interested in juniors. That is our Mr. Will Griffin. He is celebrating his 90th birthday today. The children are going to sing him a song out of the song books he gave to them. We congratulate Mr. Will on this grand occasion. But, most of all, we congratulate him on his Christian way of living, his pleasant outlook on life, and his service to his Lord and Savior and His Church. It would be good to have many like Mr. Will Griffin. The following article is from an unknown source: MR. WILL GRIFFIN RECEIVES CHURCH HONOR Mr. Will Griffin, age 92, was honored during church service on Sunday, January 20th, for his faithful and untiring service as a dedicated Christian and concerned member for the care and well- being of the church building and grounds. Deacon Jack Zorn, gave a brief history of Mr. Griffin, relating the many achievements throughout his life, with the most important, a Christian background, beginning at Good Hope Baptist Church, and his baptism in Mrs. Stevens fish pond. Mrs. Rachel Parker also gave a brief account of the many attributes of Mr. Griffin in his church work and what he means to the church and its progress. Mrs. Griffin was also recognized for her faithful Christian service. In a 13 Apr 1977 letter, Mrs. E. A. (Ellaree Dean) Speer wrote that she had visited George William Griffin and found that "Uncle Will seemed cheerful but really isn't too well - vision so bad & nothing can be done for his eyes... seemed happy to see us." In a 10 Jun 1978 letter, Ellaree noted that "Uncle Will has been in Hospital twice since Xmas - hernia & recently a skin cancer on ear." Mrs. G. W. (Elaine DeVaughn) Mendenhall wrote in a 28 Feb 1979 letter that "Uncle Will is now hospitalized in Anniston hospital. It was found the cancer had scattered to at least two obvious areas -- mouth and throat.... In spite of the anxiety of the problem, his thinking is clear and his reasoning logical." Mrs. Charles (Margaret Whatley) Lee added in a 24 Feb 1979 letter that Will's doctor "seemed to think smoking could have caused Uncle Will's problem. I don't think that he smoked much the last few years but was always a big cigar smoker." The following obituary is from an unknown source: Griffin LINEVILLE -- Services for Will Griffin, 96, of Lineville were today [3:00 p.m. 4 Jun 1979] at First Baptist Church of Lineville with the Rev. Wayne A. Stevens, the Rev. Earnest Smotherman and the Rev. Charles Handley officiating. Burial was in Lineville City Cemetery with Benefield Funeral Home of Lineville in charge. Mr. Griffin died Sunday at his residence after a long illness. Survivors include 25 nieces and nephews. Pallbearers were Jesse McCollum, Harlon Mayall, James A. Jordan, Don Hogan, Harold Paker and Jack Whatley. Honorary pallbearers were the fellowship Bible class, deacons and trustees of First Baptist Church of Lineville. Mr. Griffin was a native of Clay County and had lived in Washington, D.C., and Talladega before returning to Lineville 34 years ago. He was a member of First Baptist Church of Lineville, the fellowship Bible class and Baptist Men's Brotherhood. He served as trustee for the church and was a former member of Lineville Town Council. Memorial contributions may be made to First Baptist Church of Lineville building fund. p 204; date from memorial pamphlet. Biography* � The following article about the Griffin's 58th wedding anniversary is from an unknown source: Mr. And Mrs. G. W. Griffin Have Double Celebration Mr. and Mrs. G. W. Griffin had a double celebration on Sunday, June 5, 1977, from 2:00 until 4:00 in the afternoon. A tea honoring Mr. Griffin on his 95th birthday and honoring both of them on their 58th wedding anniversary was held at the home of their nephew, Mr. Emyl Griffin. To begin the celebration, the Rev. Wayne Stevens, pastor of Lineville Baptist Church, spoke briefly, making appropriate remarks complimenting Mr. and Mrs. Griffin on their long life together and Mr. Griffin on his 95th birthday. He closed his remarks with a prayer of thanksgiving. Mayor Jack Whatley presented a year's Honorary Mayor of Lineville Certificate to Mr. Griffin, and he also presented Mr. Griffin with an honorary Lieutenant Colonel Commission in the Alabama Militia, bestowed by Gov. George C. Wallace. Mr. Griffin received congratulations from Gov. Wallace and from President and Mrs. Jimmy Carter. These were read before the group. Approximately 160 friends and relatives called during the afternoon to congratulate the couple and to wish for them many happy returns. In a 23 Feb 1980 letter, Mrs. Charles (Margaret Whatley) Lee wrote: Aunt Tomera was a Methodist and Uncle Will was a Baptist. They both went to their own church in morning services but at night they would take turns going with the other every other Sun, one Sun. to the Baptist, the next to the Methodist. In a 10 Jun 1978 letter, Ellaree added "Aunt Tomera in hospital a week in Ashland, slight stroke. She has hardening of arteries & isn't well but up all the time." In a 10 Jan 1992 letter Ellaree wrote that "Aunt Tomera died of Alzheimer's." The following obituary is from an unknown source: Mrs. Tomera Griffin, 89 Mrs. Tomera H. Griffin, age 89, of Lineville, Alabama, passed away at the Clay County Hospital Saturday, March 31, 1979 after a short illness. Funeral services for Mrs. Griffin were at 11:00 a.m. Monday, April 2, 1979 at the First United Methodist Church of Lineville with the Rev. Ernest Smotherman, the Rev. Wayne Stevens and the Rev. Charles Handley officiating. Burial was in the Lineville City Cemetery. Mrs. Griffin is survived by her husband, Mr. Will Griffin, and a host of nieces and nephews. Active pallbearers for Mrs. Griffin were Grover Rice, Clyde Stewart. Harold Parker, Jesse McCollum, Frank Summerlin and Harlon Mayall. Honorary pallbearers were members of the Fellowship Bible Class of Lineville Baptist Church and the Administrative Board of the First United Methodist Church of Lineville. Mrs. Griffin was a native of Clay County, but she had lived in Washington, D.C. and Talladega before moving to Lineville in 1946. She was a member of The First United Methodist Church of Lineville, a charter member of the Inter Se Club of Lineville, member of the WSCS of the Methodist Church and a member of the Bridge Club of Lineville. The family has requested that memorial contributions be made to the Building Fund of the First United Methodist Church In Lineville. Benefield Funeral Home of Lineville was in charge of the arrangements. E-mail written Sep 2008 to Lew Griffin from Sarah Ann Brooks Sayers, e-mail address. Biography* � Mattie Maude was named for her aunts, Martha (Culpepper) Amsler and Mattie (Griffin) Reeves. Mrs. Charles (Margaret Whatley) Lee wrote in a 26 Nov 1978 letter about a visit with Alsie Rutland in LaGrange, GA who spoke about Maude Griffin: Alsie told us Aunt Maude used to teach school at Standing Rock [Chambers Co., AL] and she taught him, said she was very strict, but said he learned more under her than any teacher he ever had. He said she was a beautiful girl. In a 10 Jan 1992 letter Mrs. E. A. (Ellaree Dean) Speer wrote: Aunt Maude taught school, mostly county schools & when she wasn't teaching she stayed home & helped Grandmother with the housework & did a lot of needle fancy work - later years lived in a nursing home in Lineville & died there - She had a bad back & was drawn considerably - probably arthritis. p 217; obituary The Ashland Progress 5 May 1977. Biography* � A nephew, James M. Griffin, recalled that Myrtle had blue eyes. A daughter, Mrs. Charles (Margaret Whatley) Lee wrote 14 Oct 1978: My mother was a lovely, remarkable person, very out going, bubbling personality, and was young at heart along with us children and was a proud person with dignity. She worked very hard for all of us and her memories are with me forever. She had so much patience with us all. Margaret Lee added in a 6 Feb 1979 letter: All those [Griffin] boys made over my mamma lots, she was the baby. They would all have such fun when they would come for a visit. My mamma was full of life, she would always cook their favorite dishes when they would come. All those Griffin girls were great cooks. Uncle [James] Olin [Griffin] used to just love my mamma's sweet potato plate pies and also cobbler pies. I can just see Uncle Olin sitting on the front porch in the summer, they would laugh & cut up and talk about younger days. In a 27 Sep 1979 letter Margaret Lee wrote: Yes, I knew the fortune teller that used to live in Mellow Valley. Her name was Mrs. Till.... She was one of the most famous fortune tellers that's ever been in the South. She was kindly like that Mrs. Dixon you hear so much about. I never believed in her too much but my mother did. Mother went to her several times. She believed every word she [Mrs. Till] said. Mrs. Till started with coffee grounds. She could tell you all right how many children you had, she told me my husband was away from home & he was on water. He was in the Navy & on water. She told Mama her son had 2 hound dogs & you can't stand those dogs but that boy loves them dogs and told Mother to be nice to him about the dogs and we sure didn't hear any more about the dogs out of Mother (Ha!). Daddy didn't believe in her and really rather Mother didn't go but she went anyway. Mrs. Till made a lot of money but you would never know it by the way she lived. p 193; Mrs. Charles (Margaret Whatley) Lee letter 12 Aug 1979. Biography* � Robert Whatley was listed in an entry for his brother-in-law, James O. Griffin, on p. 253 of Vol. 2 of the 1927 edition of the History of Alabama and her People published by the American Historical Society, Inc. as "a farmer at Lineville [Clay Co., AL]...." A daughter, Mrs. Charles (Margaret Whatley) Lee, wrote in a 14 Oct 1978 letter: My daddy was a fine man. He was an outdoor man. He stood by us all through all our ups & downs. He worked away from home lots when younger. He had a big 8 horse team he used on construction work, move gas tanks, etc. as there were no trucks then. He usually kept a lot of livestock, cattle & horses. We used to ride horseback a lot. He also was in the logging business a long time and ran a farm too. He was kind to us and he too had a wonderful personality. In an 18 Nov 1978 letter, Margaret (Whatley) Lee wrote about the team of horses her father had: You should have seen the beautiful harness he bought, brass, red tassels on the bridles and fancy saddles. It was his pride & joy like cars & trucks are to men now. What he hauled the big tanks on wasn't like a regular wagon. The rig was called a dray.... The wheels & body were much larger than a two horse wagon. Mrs. Lee added in a 13 Jan 1979 letter: Daddy used to have to get up many nights to pull someone out of a mud hole when they would get stuck, before the streets were paved. They would pay him for it. Biography* � Erom was named from a misprint in the newspaper. Her daughter, Mary R. Lewis, wrote in a 29 Dec 1990 letter that "Mother graduated from the Albertville High School. Grandaddy [James O. Griffin] sent her there as a boarder for her senior year because he wanted her to have a good college preparatory course.... Herbert Weatherly was her boyfriend." Erom was a Graduate in Piano. The following is the yearbook entry: Erom Griffin, Hackneyville, Ala. Classical Course "Topsy" Morgan Sec'y Society '17 Member of Y.W.C.A. "Topsy," the baby of our class has only been with us since September, but her sweet and generous disposition has won for her the love and admiration of all. She's ever ready with a smile, to put down any blues that might be lurking. In the school room she is very studious but when out she is ever into mischief and is especially fond of Kodaking on Sunday afternoons when the "Weather"ly permits. But oh those teachers! "O! t-h-a-n-k y-o-u"
Although her three children were born in a Montgomery, AL hospital, Mary Erom and H. M. Lewis were living in Wetumpka, Elmore Co, AL at the time. The following obituary is from an unknown source: Beloved Teacher Mrs. H. M. Lewis Dies Mrs. Mary Erom Griffin Lewis, wife of H. M. Lewis of Quitman, died on April 21st after a prolonged illness. Mrs. Lewis, a former STAR Teacher and a beloved member of Brooks County High School's faculty until illness caused her to retire last year, taught Latin and English and was advisor to the Latin Club. It was Mrs. Lewis who originated the "Latin Day Banquet" one of the high points of the spring schedule at the high school. She was a graduate of Judson College, Marion, Ala., and prior to her marriage taught in Elmore and Coffee counties, Ala. Mrs. Lewis, who was born in Hackneyville, Ala., on January 9, 1902, was the daughter of James Olin Griffin and Minnie Strickland Griffin. She came to Brooks County in 1945 with her husband, Hester Marion Lewis when Mr. Lewis became associated with the U.S. Dept. of Agriculture Soil Conservation Service. She was a manager of the First Baptist Church, Delta Kappa Gamma, National honorary teachers fraternity and STAR teacher in 1956-57 at the Quitman High School. Surviving are her Husband and two daughters, Mrs. M. Royce Gordon of Macon, and Miss Mary Lewis, of Tallahassee, Fla. She leaves two Grandchildren, David and Elizabeth Gordon of Macon. Mrs. Lewis leaves five sisters, Miss Ruth Griffin and Mrs. R. W. Vaughn of Memphis, Tenn; Mrs. W. T. Duscoe, Union City, Tenn; Mrs. Hez Brown of Chattanooga, and Mrs. C. W. Middlecoff, Jr. of Somerville, Tenn. Three brothers survive, Mr. J. W. Griffin and Mr. L. W. Griffin of Leeds Ala., and Mr. James Griffin of Memphis, Tenn. Funeral Services were held at the First Baptist Church in Quitman on April 23rd at 4:00 p.m. Rev. William J. Smith, Pastor, conducted the services assisted by Rev. C. E. Cariker. The family requested that in lieu of flowers those who desire to do so may make contributions to Mrs. H. M. Lewis' Scholarship Fund to be awarded to Brooks County High School Seniors. Checks should be made payable to Mrs. H. M. Lewis' Scholarship Fund and forwarded to Mr. J. R. Austin, Box 255, Quitman, Georgia. Active Pallbearers were Joe Austion Wayme Jones, George Currei, Leland Jordan, Cecil Baker, and Dr. J. C. McGoogan. Honorary Pallbearers were J. H. Wells , V. C. McGinty, V.A. Maxwell, T. J. Barrs, Jr., Frank Benson, Burney Humphreys, B. H. Romine, Jesse Hampton, Lawton Lee, L. C. Spears, Dr. L. M. Shealy, Dan Mitchell, Felton Griner, Drawdy Willis, and W. E. Roberts. Entombment, Oak Hill Cemetery. Maxwell Funeral Home was in charge of the arrangements. My mother loved teaching school. Yes, you remembered correctly that she was a high school teacher and taught mainly English and Latin. She was a graduate of Judson College in Marion, AL. Grandaddy told her what to major in...Latin. Also, he ordered her to learn to play the violin, an instrument that he loved. He had been given quite a good one by a patient who could not pay with money and paid with the violin, so he sent it with Mother off to Judson where he wanted her to learn to play it. She preferred to play the piano, and did continue to study that too, but she dutifully learned to play the violin. When we lived in Marion, AL, 1935-38, she played violin in the Judson College Symphony Orchestra. Well, I've gotten off the subject, but you might appreciate these tales. When she graduated from Judson College in 1921 (aged 19), I believe that she first worked as a tutor, that is, a private teacher of the children of some wealthy individuals who lived in a small AL town and she lived in their home while being the teacher. I'm not sure whether it was Enterprise or Eclectic. I think that after one year of that, she moved into public school teaching. She was teaching in Eclectic, AL when she met my Dad who courted her a rather long time before winning her hand. Here's another aside tale...about how they met. Daddy was the County Agent in Elmore County, working for the Alabama Extension Service (you know what that is, don't you?). One day when he was in Eclectic, he saw Mother walking on a downtown street and thought she was very attractive and asked someone who she was. Upon learning that she taught at the local high school, he arranged a proper introduction by the School Principal, and then asked her if she would help him organize the 4H Club there in the high school. Well, at that time in AL history, the state did not allow married women to teach school. So when they got married, she had to give up her teaching career. That law remained in effect a long time and it wasn't until 1943, when we moved to Augusta, GA that she started teaching again, across the river in South Augusta, SC. I think the rules about prohibiting married women from teaching tumbled down everywhere during World War II when women were needed to do many things in the labor force while the men went to fight the war. Mother taught for the rest of her life after resuming in 1943, specializing in Latin and English in high school. She loved to organize the Latin Club and loved going to her Teachers' Honorary Professional Sorority (Society?) with her friends. The meetings were held in Valdosta, GA, about 15 miles from Quitman. Biography* � The following obituary is from an unknown source: Leeds leader, J. W. Griffin, buried today A Leeds community leader, 65-year-old Joseph Wyeth Griffin, was buried today with graveside services at Shiloh Cemetery, Griffin was past president of the Leeds Chamber of Commerce and chairman of the Leeds Water Works Board for 25 years. He served with both the Leeds and the Jefferson County zoning board, and was Leeds city clerk for several years. A native of Tallapoosa County, Griffin was a director of Birmingham Federal Savings & Loan Association, charter member of the Leeds Civitan Club and president of Leeds Insurance Agency. Survivors include his wife, Julia Judge Griffin; a daughter, Mrs. W. H. Cooper III, Gulf Breeze, Fla; a son, James J. Griffin, Atlanta; five sisters, Miss Ruth Griffin, Mrs. C. M. Middlecoff and Mrs. Ralph Vaughn, all of Memphis, Mrs. Hez Brown, Chattanooga, and Mrs. Tom Duscoe, Union City, Tenn; and two brothers, Lewis W. and James M. Griffin, both of Memphis. The family suggests that any memorial contributions may be made in the form of contributions to the Lurleen Wallace Courage Crusade or to another charity. Biography* � In a 31 Jan 1982 letter, Ruth wrote that she and her sister (Erom?) both taught at the Elmore County High School in Enterprise, AL. Ruth also worked in the Catalog Department at Sears Roebuck & Co. for many years. Mrs. C. W. (Marie Griffin) Middlecoff wrote in a 13 Feb 1995 letter: Ruth graduated from high school in Eclectic, Ala. Sister [Erom?] was teaching there. Ruth stayed with her. Goodwater, Ala. did not have an accredited high school. Then Ruth went to Judson College (Marian, Ala.) for 2 yrs. She changed to Montevallo, which is part of the University of Ala. now. She taught 2 yrs. at Enterprise, Ala., + 3 years at Ozark, Ala. This was during the depression. They payed the teachers in warrants. She quit and came back home to 1245 Central, Memphis, Tenn. She worked in the County Agents office in Wetumpka, Ala. for about 5 yrs. She went back to Memphis and got a job with Sears. Mail order working in the office until she retired in 1971. She lives in the family home in Midtown Memphis. Correspondence from Mary Ruth Lewis Ph. D., Houston, TX, to Lew Griffin, 3 Sep 1997. Biography* � James wrote in a 14 May 1977 letter that "my middle name is for a doctor." The following is from an unknown source: Southerners Win New Distinctions In Foreign Fields Some Earn Promotions; Others Rewarded for Heroism On Distant Fronts STAFF SERGT. JAMES M. GRIFFIN, son of Dr. and Mrs. J. O. Griffin of 883 Hawthorne, has been awarded the Bronze Star for meritorius achievement in battle on Leyte. While sergeant in charge of an alert platoon, "Sergeant Griffin exercised admirable leadership in taking precautions for the safety of the area during a Japanese attack," his citation reads. Sergeant Griffin entered the Army Air Forces in June, 1942, and has been overseas 20 months with a photo intelligence detachment. Biography* � Ralph and Louise lived in Sun City from 1976 until 1990. 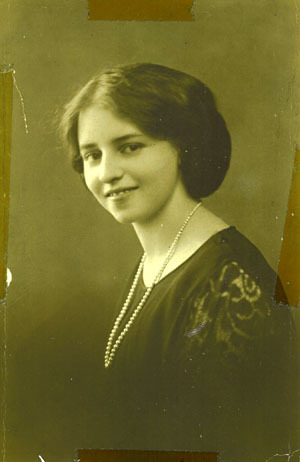 Louise, a graduate of Alabama College for Womenn at Montevallo, was a successful teacher. Louise taught in a small AL town where she met Ralph. They fell in love and wanted to marry. AL still had the law prohibiting married women from teaching and Louise did not want to give up her job. So they got secretly married during the school year. However, word leaked out and the School Board met to decide what to do about Louise. They decided that she could complete the school year, but she was not allowed to continue after that. E-mail written 2003 - 2005 to Lew Griffin from Barbara Louise Vaughn Davis (Mrs. Charles Davis), Maryland Heights, MO, e-mail address. Biography* � Marie was named after Mrs. Olga Bazut, a woman Dr. Griffin had treated in France during World War I. The following is a translation of a portion of a 8 Mar 1919 letter Mrs. Bazut wrote thanking Dr. Griffin for his care: I am very happy at the thought of seeing you again soon, you will have the great joy of finding your little sick one very changed. This is your work. I hope that you will be happy always, it will be with pleasure that I will think of you. In my life I will not forget you. You took such care of me that never will I be able to thank you enough. You alone have known to bring me back to life, now I hope that my health will get better every day.... Do not forget your little sick one, and especially do not go through without coming to see me. Best regards from my husband, from all my family. A sister, Ruth Griffin, wrote in a 7 Aug 1982 letter that "Marie retired from teaching this past May. She keeps busy with her yard, the house and grandchildren." Mrs. Marie Griffin Middlecoff, a resident of LaGrange Road near Somerville and a retired educator who was involved throughout her lifetime in various civic and community organizations, died at 11 PM. Monday, October 29, 2001, at her residence. She was 81 years of age and died following an extended illness. Funeral services were conducted at 2 P.M. Thursday, November 1st at the Somerville First United Methodist Church with Rev. Walter German, Pastor of the Church, officiating. Interment was at the Memorial Park Cemetery in Memphis. Peebles Fayette County Funeral Home of Somerville was in charge of arrangements. Mrs. Middlecoff was born April 18, 1920, in Goodwater, Alabama. She was the youngest of nine children born to Dr. James Olin and Minnie Dallas Strickland Griffin. At an early age she moved to Moulton, Alabama and at the age of eight, moved to Memphis, Tennessee. There she attended Bruce Elementary School and graduated from Central High School in Memphis in 1937. She received her Bachelor of Science Degree in education from the University of Memphis in 1940. She was married August 9, 1943, to Charnell Whitfield Middlecoff, Jr. of Memphis. The couple lived in Sioux City, Iowa and Boise, Idaho Where, Mr. Middlecoff was stationed while serving in the Army Air Corps during World War 11. In 1951, the Middlecoffs purchased a farm in southeastern Fayette County to begin their farming operations and in 1957 their family moved to the farm. They had been residents of Fayette County sine that time and Mr. Middlecoff operated the farm until his death on April 29, 1986. Mrs. Middlecoff was a public school teacher in Memphis in earlier years and taught school in the Fayette County public school system for sixteen years before her retirement. Mrs. Middlecoff was a devoted member of the Somerville First United Methodist Church as long as health permitted. She was a member of the Alpha Delta Pi Sorority of the University of Memphis and had served as President of the organization. In earlier years she was a Sunday School teacher, a Cub Scout leader and a Girl Scout leader. Mrs. Middlecoff had served as President of the Parent Teacher Association and was a member of King's Daughters, Delta Kappa Gamma and the Craddock Book Club of Somerville. She had been involved in Farm Bureau activities for many years and was a member of the Fayette County Farm Bureau Women. Mrs. Middlecoff was an active supporter of the Tennessee Farmers Cooperative during the period that Mr. Middlecoff served as District Representative. Mrs. Middlecoff is survived by her daughter, Esther Marie Middlecoff Stevens of Lakeland; two sons, Charnell Whitfield Middlecoff III of Somerville, Richard James Middlecoff of Germantown; two sisters, Clarice Duscoe of Nashville, Frances Brown of Charlotte, North Carolina, eight grandchildren and two great-grandchildren. Casketbearers were John David Douglass, Clay Hopkins, Whit Middlecoff, IV, Dr. Will Middlecoff, Tom Peebles, Andrew Stevens, John Paul Stevens and Richard Stevens. Biography* � Jerry Kirk, "Our Thanks to You, Director Middlecoff" Tennessee Cooperator circa 1976 Its known as "rotating off the board," and it has happened to one of the finest men we know. Mr. C. W. Middlecoff of Somerville, because he has served the maximum number of consecutive years allowed under the bylaws, has "rotated off the board" of Tennessee Farmers Cooperative. As Mr. Middlecoff steps down as a director, we welcome his successor on the board, Mr.\ John L. Roberts of Lexington, another outstanding farmer and agriculture leader. Mr. Roberts was elected last month at TFC's annual meeting to replace Mr. Middlecoff as the director from District 2. Plans had all been made to honor Mr. Middlecoff during the annual meeting in Nashville-to salute him for his dedicated service as a TFC director. Among those ready to say some really nice things about Mr. Middlecoff was Ralph Carter of Greene County, TFC's 1975-76 president. There was a plaque to be presented to Mr. Middlecoff, too. But Mr. Middlecoff was unable to attend the annual meeting because his lovely wife, Marie, was hospitalized at the time. "It was nine years ago that the TFC membership showed the good judgement to elect a conscientious, hard-working farmer from Fayette County to serve as director from District 2. "Yes, it was in 1967 that C. W. Middlecoff of Somerville was first elected to the TFC Board of Directors. And it seems that time moves especially fast when you have a good thing going. TFC for nine years has had a good thing in Director Middlecoff. "We can't let his service on the board end without recognizing Mr. Middlecoff for the valuable contributions he has made as a director. "He has always been a respected member of the board. Respected for his ability to grasp an issue and suggest courses of action. Respected for his convictions, his insight, his judgments, his decisions. They've all contributed immeasurably to the unparalleled success which TFC has experienced during the past nine years. "During his tenure on the board, Mr. Middlecoff served as President of TFC in 1973. "Our retiring director has also been an active member of Fayette Farmers Cooperative in Somerville for some 25 years now. He's the current board president, an office he also held in 1967. "To you, Mr. Middlecoff, we say 'thank you' for the years of unselfish service which you have given to the cooperative system in Tennessee. The contributions which you have made while serving on our TFC board will continue to bear fruit for many, many years to come."